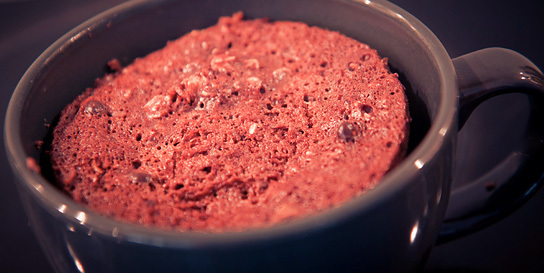 A guilt-free, 5 minute chocolate mug cake recipe? IMPOSSIBLE I hear you say. 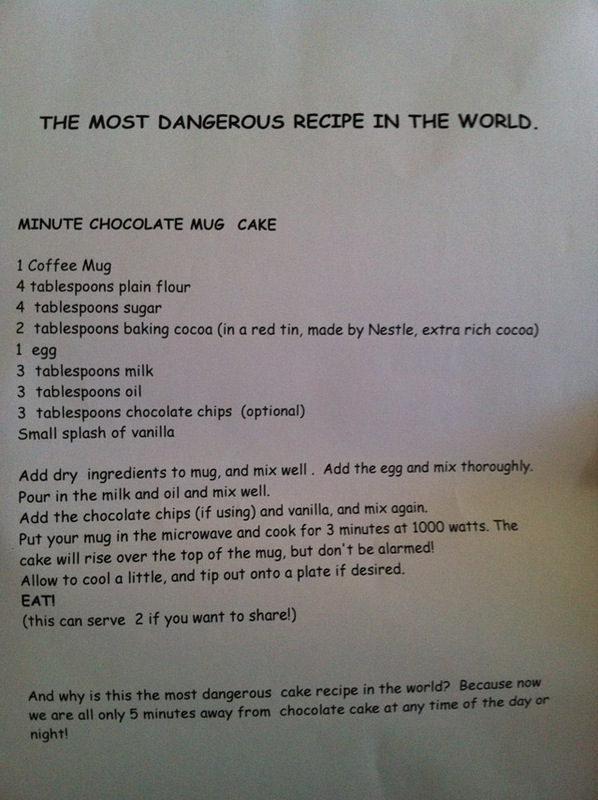 This bad-boy came about from a VERY dangerous recipe that my wife picked up whilst at a bridal shower. It was basically the recipe for a 3 minute chocolate cake. No matter where you were – at any place, at any time that had BASIC cooking ingredients, you were 3 minutes away from chocolate indulgence. Unlike most recipes – If you strip away the naughtiness from it, the end result will be dull, tasteless and pointless. 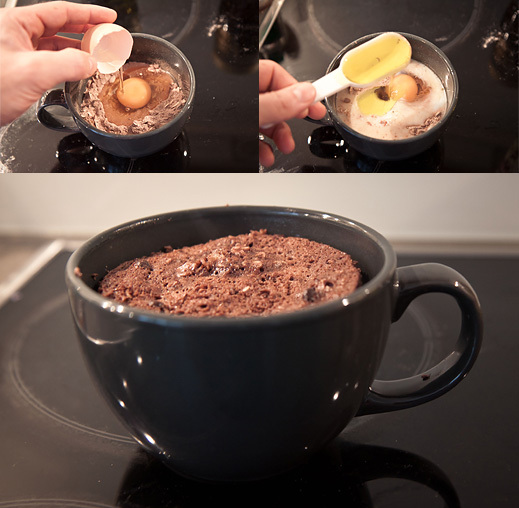 This is where, with a few tweaks, the chocolate mug cake really shines. Thankfully, the ingredients are so simple and easy to substitute with healthier options, that the end results are WAY better than anticipated. 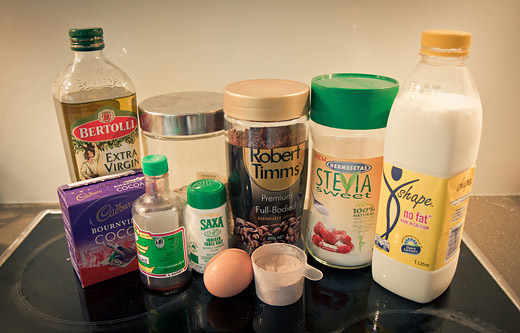 The ingredients are your ‘basic’ house-hold items but with a scoop of protein powder. (note: the coffee is sh*t – don’t use the pictured brand if you can help it). I’ve been through so MANY variations of this beloved recipe before unleashing it on the internet today. I reckon I’ve ‘NAILED IT’ to the point where it’s ‘almost’ as good as the original (naughty) variant. 1. Grab a decent sized mug that will fit all of the ingredients (jumbo sized). 2. Add all of the dry ingredients FIRST and stir to combine. 3. Follow this with the wet ingredients and stir to combine. 4. Place in a Microwave oven for 1.5 – 2 minutes on HIGH depending on how moist you like it (and how strong your oven is). 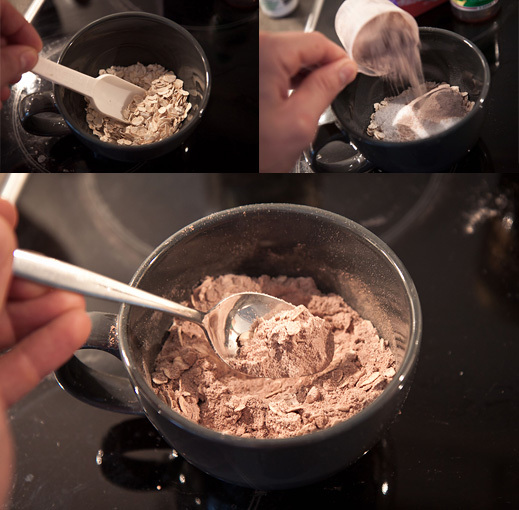 All of the dry ingredients should be stirred prior to adding the wet ones. Note: The mug pictured is jumbo, but I’ve since made the recipe in a standard sized coffee mug with the exact same results. 1. This goes GREAT with full-fat ice-cream. That’s right – full fat. None of this fat-free rubbish that is full of sugar anyway (If you’re gonna eat ice-cream, at least do it properly). 2. Make sure you DON’T overcook the pudding. Maybe try 1min on high first then see if it needs longer. 3. Under any circumstance do NOT remove the oil – this is what makes it soft and ‘pudding-like’ (Will be a waste of time without it). If you skipped the ice-cream part, then good for you – it really is guilt free. I reach for one of these bad boys whenever I’m craving something sweet. Not only will it keep you full for hours, but it’ll give you a decent protein hit as well. Enjoy!